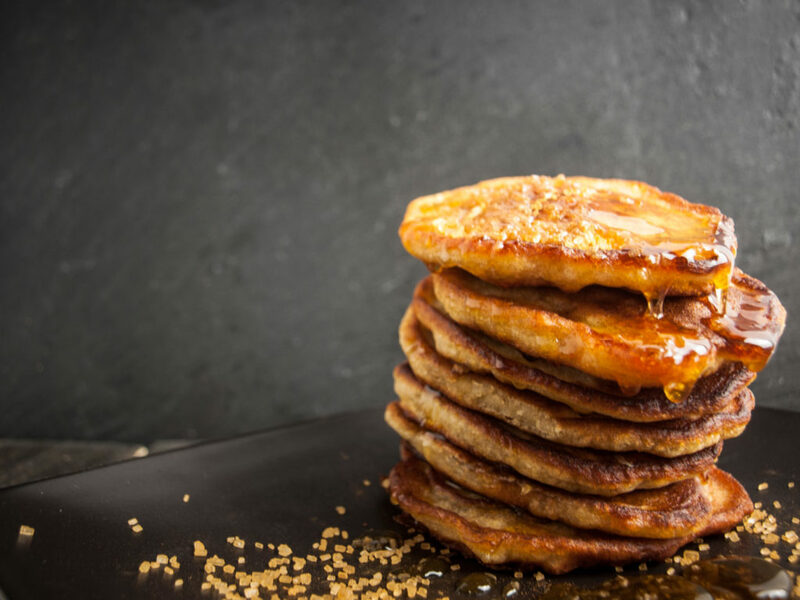 Fluffy Caribbean pancakes with banana and a hint of vanilla and cinnamon – just the perfect dessert! The fritters will get nice and brown on the outside with the edges caramelizing. The inside puffs up, giving you a nice fluffy center in the middle. Yes indeed – pancake perfection! When you look at the ingredients you may wonder that there is no liquid in the batter. Don’t worry about it, there’s no need for water or milk. The banana and the egg are just liquid enough to make a perfectly smooth batter that will give you ridiculously tasty fritters! Come on, make some tasty fritter treats! Honey avalanche on a mountain of banana fritters! Go bananas, make batter, fry some fritters! Get a bowl, peel the bananas and break them into bite size pieces. Mash the banana pieces in the bowl with a fork until you have a mushy pulp. Crack the egg into the bowl and use the fork to mix egg into the banana pulp. Add the sugar, vanilla sugar, cinnamon and flour to the bowl. Use the fork to mix everything together until everything comes together into a smooth batter. Grab a frying pan and put it on medium-high heat. Add a good amount of oil to the pan and wait until the pan is properly hot. One-by-one drop 4 tablespoons of batter into the hot oil. Try to make sure the fritters do not touch. Fry for about 3 minutes per side until golden brown. Flip the fritters and fry them on the other side for another 2 minutes. Remove fritters from the oil with a slotted spoon and drain on kitchen towels. Repeat with the rest of the batter. You may want to add some more oil to the pan if it gets to dry. Place a big scoop of ice cream on each portion of fritters, drizzle with honey or sprinkle them with a dash of sugar and cinnamon. Serve immediately while they are still warm! Let me know what you think about the recipe in the comments below! Did you ever had banana pancakes like this? Aren’t they just the best? What are your favorite toppings for these fluffy fritters? Are there any other ways you use to get rid of mushy old brown bananas? Let us know underneath!